The City of Kanhaiya gets coloured in the shades of Lord Jagannath: Crowds throng to pull the Lord’s Chariot. Lord Krishna’s Braj Bhoomi got a new shade of devotional fervor as different Rath Yatras (Lord Jagannath’s Chariot pulling ceremonies) were started from different Temples of Mathura and Brij. The Rath Yatras were showered with flowers and worshipped (by performing Arti) at various places. At the commencement and conclusion of Rath Yatras in Vrindavan even mangoes were distributed to the public as Prasaad (edible articles to be consumed by the devotees – mainly of sweet taste which are blessed by the presiding Deity for good luck). Where in Mathura the Rath Yatra was started from Lord Krishna’s Janmabhoomi (birth-place) amongst the chanting of Vedic Mantras and Praise of Lord Jagannath, in Vrindavan the Rath Yatra was started from the three Temples at different times. According to mythology this Rath Yatra symbolizes the Suryanarayana (The Sun God) nature of Lord Jagannath. During the Rath Yatra it is believed that Lord Shri Jagannath, Devi (Goddess) Subhadra and Lord Thakur Shri Balaram visit their devotees and bless them as they tour through the city seated in their Chariots. Just as Lord Rama had returned to his city Ayodhya after completing his exile and his return was celebrated with the festival of Deepawali; Lord Krishna’s arrival in Braj is celebrated by this Rath Yatra. 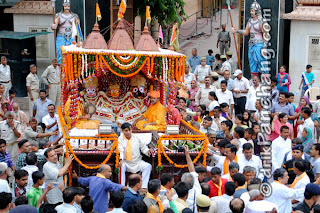 Before the start of Rath Yatra, the Sudarshan Chakra of Lord Shri Krishna arrives from Lord Jagannath Temple situated in Bhagwad Bhawan of the Lord’s Janma-Bhoomi; then arrives Lord Balbhadra, Goddess Subhadra and Lord Shri Krishna (in this order) in all their festive costumes, jewellery and glory and take their respective thrones in the Chariot. 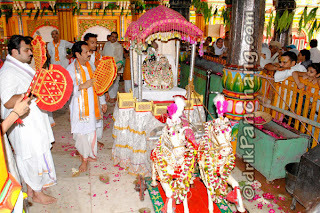 Typically there are three separate Chariots in the Rath Yatra but in the Rath Yatra from Lord Krishna’s Janmasthan (birth place) these three Chariots were symbolically included in one Chariot itself. After this, began the chanting of Vedic mantras to invoke the Gods and worship was performed according to predestined rituals and just as the time to pull the Chariot came, the devotees went into a mutual competition to be a part of this sacred tradition. Right from the Rath Yatra start from the Lord’s Janmasthan to Deeg Gate, Mandi Ramdas, Chowk Bazar, Swami Ghat, Chatta Bazar, Holi Gate, Kotwali Gate, Bharatpur Gate and back to the Lord’s Janma Sthan till the Yatra’s conclusion, ladies and children showered flowers on the Chariot from the roofs of the buildings. All along the rath yatra route offerings of rice as Prasad was distributed to the devotees. When the procession arrived back to the birthplace of Lord Krishna late at night, the Janmasthan hall once again echoed with the praises of Lord Jagannath. After this Lord Shri Jagannath was enthroned in the Gundicha Temple near the Vigraha of Shri Chaitanya Mahaprabhu and a public feast (i.e. Bhandara) was organized for the devotees. In this series, the Rath Yatra from the three temples of Vrindavan i.e. Madan Mohan Temple, Govind Dev Temple and Gopinath Temple was started at different times. In the Madan Mohan Temple raw offerings were made to the Lord as Bhog (offerings made by devotees to the Lord along with prayers to request the Gods to accept their offerings). Pulled by the devotees, as the Lord’s Chariot moved forward, it was lead by a band playing devotional music and the atmosphere of Vrindavan was filled with reverence and devotion. Listening to the band’s tunes on devotional music, some devotees started dancing spontaneously. Starting from Jagannath Ghat, the Rath Yatra went through Banke Bihari, Atkhamba, Vankhandi, Anaj Mandi, Rang Ji, Gopinath Bazar, Gyan Gudari, Goda Vihar and from near Lala Babu Mandir Temple returned back to the Temple and ended late in the evening. Along the Rath Yatra route there was a constant rush of devotees, all of whom wanted to pull the Lord’s Chariot. Children as well as elders could be seen rushing and busy gathering the mangoes which were being distributed as Prasaad from the Lord’s Chariot. It is said that this tradition is 300 years old. Today there was a special Bhog of Amaras (refreshing drink made from Mango pulp) to the Lord in the temple. Before the commencement of Rath Yatra from Govind Dev, the Thakur Ji (i.e. Lord Jagannath) was adorned with a new attire. All the three Rath Yatras gathered at Gyan Gudari and after the Parikramaa (i.e. the ritual of offering prayers with full dedication and devotion to the Lord while walking around to encircle the Deity or Temple or Chariot), the Rath Yatras returned to their respective Temples. Although the Rath Yatra of well-known Shri Dwarkadheesh Temple was organized within the Temple premises, the devotees got the blessings of the Lord by witnessing and taking part in the ceremony there itself.